Just enter via rafflecopter link below. Best of luck! illiam and Donna were born on the same day, in the same Dublin maternity hospital. But there the similarities end. Will grows up in an affluent suburb and struggles to balance what he wants with what will keep his overbearing mother happy. Across the city, Donna, raised by her older sister, often wonders what life would be like without her troubled mother around. Over the years, Donna and Will almost meet many times, but something - fate? - keeps them apart. Then tragedy strikes for each of them. As Will tries to come to terms with a life-shattering event, he decides to travel the world in the hope of finding happiness. Donna, now alone in the world, makes plans to leave Dublin to fulfil a life-long dream. More than 10,000 miles from home, they finally meet. And they know nothing will ever be the same. When a terrible disaster separates them, Will and Donna find they can't stop thinking about each other, about what might have been. When Maria Duffy left her career in the bank to become a stay-at-home mum, she never dreamed that writing, something she's always loved, would become her job one day. Her first novel,Any Dream Will Do, was published in 2011, and became a bestseller in Ireland, as did all of her subsequent novels: The Terrace, The Letter, and One Wish. A Love Like This is her fifth book. She lives in Dublin with her husband Paddy and their four children. 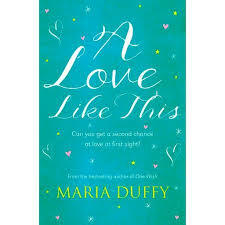 Ever since my Twitter started buzzing with Maria's latest (courtesy the lovely Irish bloggers I follow, she is on my to be read list. Besides a Love Like this, I want to read The Letter and The Terrace. As for naming one of Maria Duffy's, Any Dream Will Do seems the obvious choice. One Wish. I would love to read this book, it's at the top of my wish list. Yay for the return of #IrishFictionFortnight and thank you for bringing it back! Another of Maria's books is called One Wish. Any Dream Will Do. Good Luck everyone!